only through what is given to the passionless ones. only through what is given to those without ill-will. Explanation: Fields have weeds as their bane. are possible only through what is given to the one without illusion. are possible only through what is given to the one without desire. those free from lust yields great benefit. to those free from ill will yields great benefit. giving to those free from ignorance yields great benefit. giving to those free from covetousness yields great benefit. to (359) of this book, with reference to a deva named Ankura. the nose. To be disciplined in the tongue is good. to be disciplined in words. It is good to be disciplined in mind. and each of them claimed that what he was practising was the most difficult. nose is good, good is restraint in the tongue. 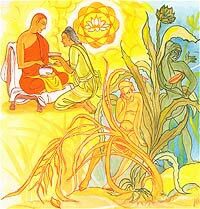 the senses is freed from all ills (Samsara dukkha). do not know who an outcast is nor the conditions that make an outcast. 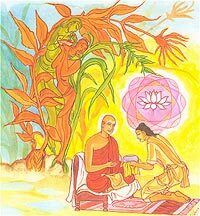 “Yes, Venerable Sir,” replied the brahman. deceitful — know him as an outcast. 2. “Whosoever in this world kills living beings, once born or twice born, in whom there is no sympathy for living beings — know him as an outcast. 3. “Whosoever destroys and besieges villages and hamlets and becomes notorious as an oppressor — know him as an outcast. belongs to others, what is not given to him — know him as an outcast. pressed to pay, saying, ‘I owe no debt to you’ — know him as an outcast. and grabs whatever that person has — know him as an outcast. 8. “Whosoever by force or with consent associates with the wives of relatives or friends — know him as an outcast. 9. “Whosoever being wealthy supports not his mother and father who have grown old — know him as an outcast. detrimental, and talks in an evasive manner- know him as an outcast. be known to others, and commits evil in secret — know him as an outcast. visit — know him as an outcast. 14. 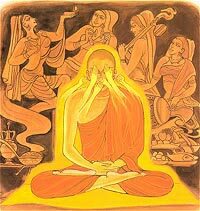 “Whosoever deceives by uttering lies, a brahman or an ascetic, or any other mendicant — know him as an outcast. 16. “Whosoever in this world, shrouded in ignorance, speaks harsh words (asatam) or falsehood expecting to gain something — know him as an outcast. 17. “Whosoever debased by his pride, exalts himself and belittles other — know him as an outcast. so, is a thief in the whole universe — he is the lowest of outcasts. 21. “Not by birth is one an outcast; not by birth is one a brahman. 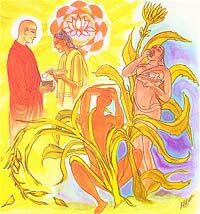 By deed one becomes an outcast, by deed one becomes a brahman. 23. “This Matanga attained the highest fame so difficult to gain. Many were the warriors (kshatriyas) and brahmans who went to attend on him. 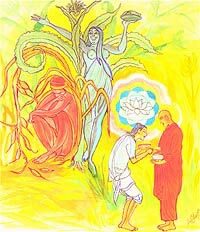 the Brahma realm having given up sense desires. 27. “Not by birth is one an outcast; not by birth is one a brahman. 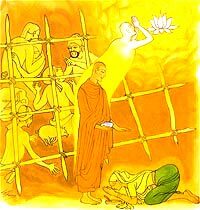 his offering to the great Brahma, his God, when his eyes fell on Buddha. Buddha’s stress on anger and hatred in his very first stanza. the Jathivadi badtimes VIEWS Paper.